The 868 Laboratory NIR moisture analyzer is MoistTech’s at-line moisture sensor that features a large rotating sampling dish for the rapid moisture analysis of raw and non-homogeneous materials. The 868 moisture gauge incorporates MoistTech’s well-proven IR-3000 online moisture transmitter optics and electronics providing superb accuracy, and resolution of any similar technology gauge. Unsurpassed in performance, stability, reliability, maintainability and cost of ownership the 868 moisture control system is the answer to controlling moisture in your product. 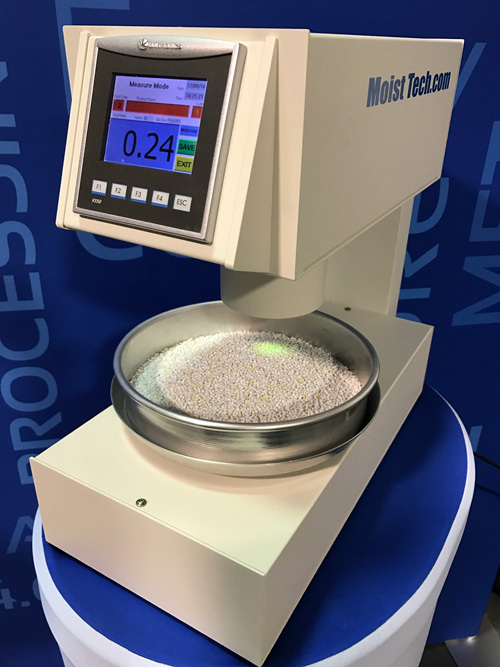 Ideal for laboratories or near processing lines MoistTech’s 868 moisture control system features a removable, rotating sampling dish providing the most accurate true moisture readings for raw and non-homogeneous materials. Samples of product are placed in the dish can provide precise measurements in as fast as 3 seconds. With the 868 moisture analyzer you will dramatically improve product quality, providing both energy savings and potential increased productivity with lower material losses. Additionally, it requires only a one-time calibration, is maintenance free and the drift free optical design that allows operating personnel to confidently make immediate process adjustments based on real-time measurements. The 868 moisture sensor incorporates a large color touch-screen PLC that offers the ability to set sampling times, calibration of up to 50 different product codes and data storage that is downloadable to your PC. MoistTech has the worldwide reputation for its exceptionally accurate NIR (near infrared) sensors and software for moisture testing, measurement and control, the newly developed 868 moisture analyzer and software can be configured and calibrated for numerous components in virtually any application. You can find more information about MoistTech’s moisture sensor applications and what products are ideally suited for accurate and precise moisture testing, measurement and control. In addition, thousands of moisture analyzers are installed on MoistTech applications, not only for the measurement of moisture, but also for other applications, such as measuring and controlling: coating thickness, resin content, oil, protein, fat, nicotine, sugar, seasonings, plastic film thickness and many other constituents.